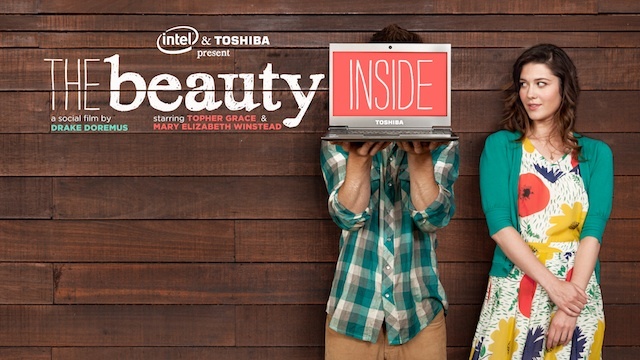 Toshiba and Intel – The Beauty Inside | Sensory overload. The issue – How to market a product you can’t see? How can you get the customer to see the “beauty inside”? Well if you’re Toshiba + Intel you hire award winning film director Drake Doremus to create Hollywood’s first “social film”. Starring Topher Grace, Mary Winstead and, more importantly ‘YOU’ the film is broken up into 6 episodes along with interactive storytelling that all takes place on the main character’s Facebook timeline. They say you only get once chance at a first impression, well not for the main character Alex. He wakes up every morning with a new appearance – male, female, tall, short, old, young…but for one constant – always the same person on the inside. This has been happening ever since he can remember. He records his transformation on his Toshiba Laptop and shares videos and photos on his Facebook timeline for us, the audience, to participate in. The genius idea of this is that Alex is played by members of the audience throughout the experience. Alex’s weird transformation becomes more of an issue as he inevitably falls for a girl who never know’s it’s him as everyday he has this completely different appearance. Watch the first episode and I promise you’ll soon become engrossed by this completely novel concept that demonstrates the point perfectly that it’s what’s on the inside that counts (Intel if you hadn’t got the link). Great concept. Great use of social. Great audience participation. There’s only one word for it really….